Not all heroes wear capes and tights. As president of the USF chapter of a Jewish social fraternity, Matthew Smalbach eliminated the chapter’s hazing culture, an achievement that led to his consideration for the 2013 Hank Nuwer’s Anti-Hazing Hero’s Award. 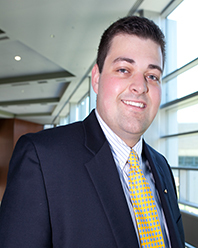 As Alpha Epsilon Pi president, Smalbach oversaw philanthropic and community service events and increased chapter membership by 300 percent. In 2013, Smalbach served as the chairman for an award-winning National Hazing Prevention Week. But his work with Alpha Epsilon Pi is just the start of Smalbach’s commitment to the USF community. Smalbach founded Sigma Alpha Pi, a national society for leadership and success, and is a member of Omicron Delta Epsilon, the International Economics Honors Society, and Order of Omega, the International Greek Honors Society. He currently serves as the vice president of human resources of USF Enactus, where he oversees recruitment, retention, and member development. Smalbach interned in the rotational research department at the Federal Reserve Bank of Chicago and has worked as a research assistant at USF since 2012. Along with these accomplishments, Smalbach has logged more than 5,000 community service hours while at USF, been involved with Student Government, and started the publication process for a research paper.